Breakfast of champions :) They are knock-you-over sweet, especially for breakfast, but what a great treat! In a large bowl, combine dry ingredients and mix thoroughly. In a small sauce pan, over low heat, combine wet ingredients and mix until butter is melted. This mixture should not get too hot, rather go for slightly warm. Add wet to dry and gently mix. It should form a very soft dough. Now, you can either scoop dough into your ungreased nonstick mini-doughnut pan or a regular size muffin pan. Note: If you are making mini-doughnuts it will make about 20, if you are making regular size muffins, it will make 6 very full muffins or 10 more normal size muffins. Smooth out the top of the dough with your fingers. Bake for 10-12 minutes. Doughnuts should not be brown on top. Invert hot pan over a cutting board or cooling rack to release doughnuts. Allow to cool completely before decorating. Temper or melt 6 oz of chocolate either over low heat in a double boiler or in the microwave using short bursts, about 30 seconds, stirring in between. Stir until chocolate is smooth and barely warm to the touch. Dip or pour chocolate over cool doughnuts. Allow most excess chocolate to drip off then place on a cooling rack with a plate or tray underneath to catch remaining chocolate drips. You could also use wax or parchment paper as an alternative. Briefly refrigerate to help chocolate set. 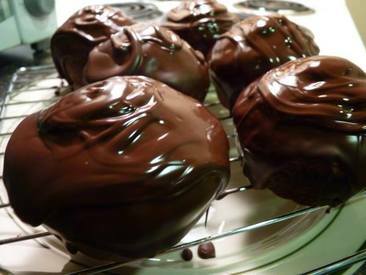 After 15-20 minutes, or until chocolate is set, remove from the refrigerator and eat or place the doughnuts in a tupperware to keep fresh until you want to serve them.